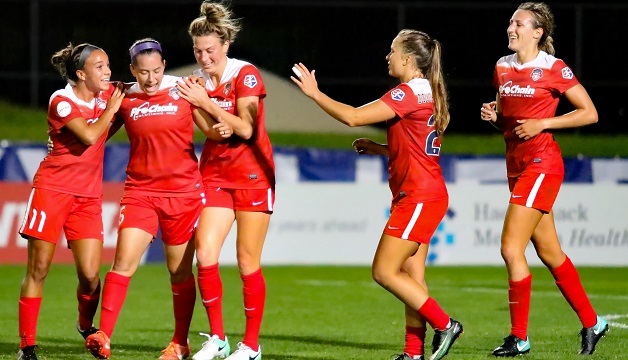 Piscataway, N.J. (September 10, 2017) – The Washington Spirit stormed back from a 1-0 deficit with a pair of goals late in the second half to secure a 2-1 road win over Sky Blue FC on Sunday evening at Yurcak Field. After Sky Blue’s Maya Hayes netted a goal in the closing minutes of the first half, Washington put two across in the final 15 minutes of the second half, on a 75th minute header by Whitney Church and a long range strike by U.S. international Mallory Pugh for the game-winner in the 85th minute. Both teams’ defenses held strong for the first 40 minutes of action, until Hayes put the home side up 1-0 in the 43rd minute to send Sky Blue into halftime holding the lead. Following a big save by Spirit goalkeeper DiDi Haracic on a shot by Sky Blue’s Sam Kerr, and then two more blocked shots off the foot of Kerr, the ball fell to the feet of Hayes, who slotted a left-footed shot into the top left corner of the net. Haracic recorded a career high seven saves in the victory, while Zadorsky, Church, Caprice Dydasco and Kassey Kallman all played the full 90 minutes on the Spirit back line. Zadorksy led all players for both teams with 10 clearances, while Church had game-highs in interceptions with seven and in blocked shots with three. Kallman led the Spirit with three tackles. Rookie midfielder Meggie Dougherty Howard had a team-high 55 total passes, 40 of which came on the attacking side of the field. In her first start as a member of the Spirit, Morgan Proffitt finished second on the team with 45 total passes. With the win, Washington completed a season sweep of Sky Blue FC, winning all three match-ups against the New Jersey side. VENUE: Yurcak Field – Piscataway, N.J.